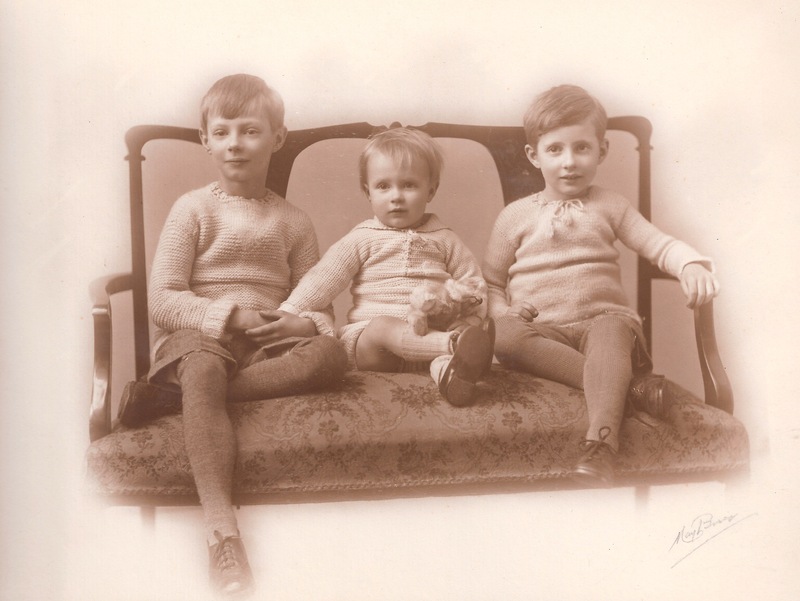 John Custance Baker was born in Penang in Malaya in 1921, the youngest of three boys. He was small, weak and suffered from asthma. As he grew up, he became quiet, humorous, patient and loved by all who came in contact with him. 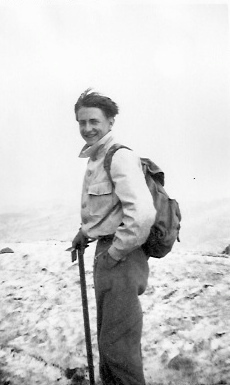 He did have at least one asthma-free period when his mother came and took him, aged ten, to live for a year in the French Alps. He learned to ski, speak French and – so long as he remained above 3000 feet – he stayed free of asthma. He continued to return to mountains whenever he could. John followed his older brother, Alan to King’s School Canterbury. 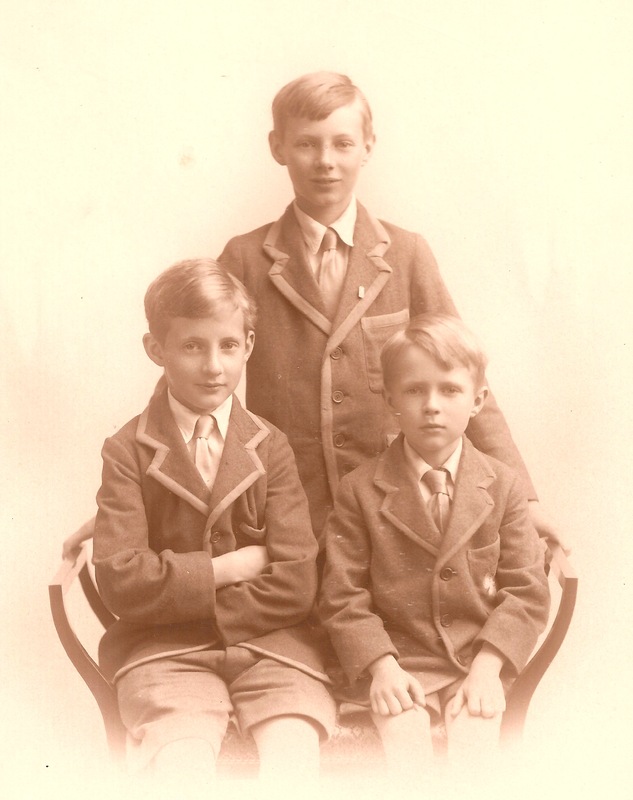 Both boys were the smallest in their year and stayed small; both coxed for the school rowing team for record stints. 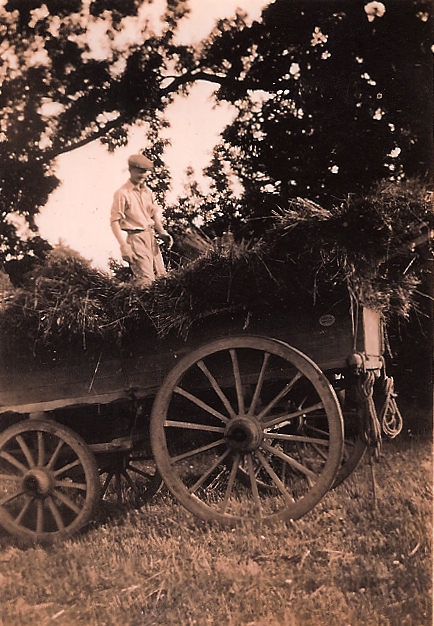 On leaving school in 1939 John decided to take up agriculture believing that he managed better out of doors. He had started a student placement working on a farm and grew fit and strong. However, on 18 November 1940, without informing his family, he enlisted in the RAF. His records show that he was 5’4” with a chest measurement of 29”, Medical Category Grade III [Those who present such marked physical disabilities or evidence of past disease that they are not fit for the amount of exertion required for Grade II]. John seems to have contested his medical grading, and although it was not altered on his records, in March 1941 he was categorised as ‘Fit All Aircrew’ and then recommended for training as ‘Obs. only’ in February 1942. By June 1942, his mother mentions that he is training to be a navigator and in December1942 his records show he is U/T Nav. On 26 November 1943 F/O J M W Briggs, Pilot, arrived and two days later he was test-flying Mosquitos with John as navigator. On the 29 November the squadron learned that Briggs had been awarded the DFM and promoted to Flight Lieutenant. From then on Briggs and Baker were a team and only occasionally flew with other pilots/observers. On 30 December John was promoted to Flight Sergeant. 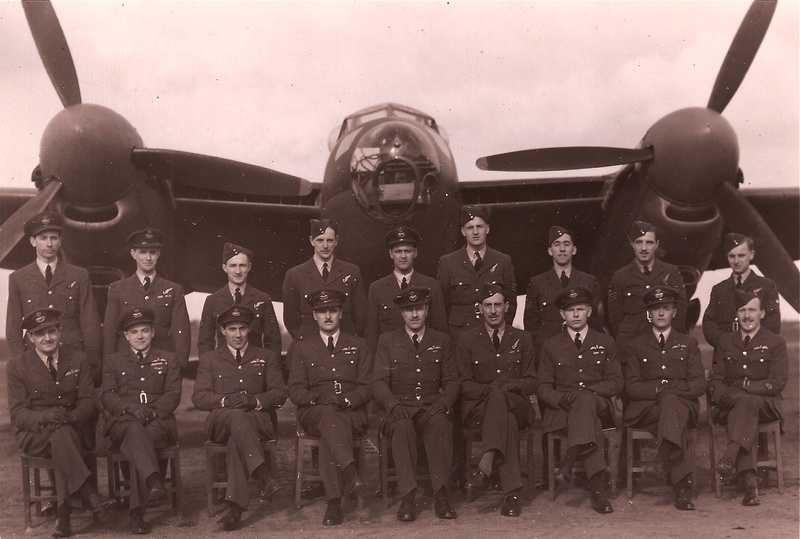 In January 1944 the Squadron moved to Wyton and in March John received his commission as Pilot Officer. George remembers returning to his room one day and finding John with the window open waving smoke away. Puzzled, since John did not smoke, he inquired and John explained that they were (Potter’s) asthma cigarettes and he asked George not to mention this to others. Throughout 1944 Briggs and Baker went on PAMPA (Photorecce And Meteorological Photography Aircraft) missions, sometimes two in one day. These were often long distance and always dangerous, though John refers to one along the French coast as a pleasant “beachcomber”. They had some near squeaks, as when their Mosquito swung off the runway on landing due to bullets through the starboard tyre and wing petrol tank, of which they had been unaware. On 4 May 1944, about 25 minutes into a flight, John became unwell and they had to return to base, but by 8 May he was well enough to fly on another mission. In September 1944, with Squadron Leader (later Wing Commander) Nigel Bicknell DSO, DFC, John had an hour of dual flying. Nearly all crew members were able to do more than one job in an emergency and in a Mosquito, stripped down for speed and with a two-man crew and no guns, it would be important that the navigator could, in an emergency, fly. On 15 October Briggs was awarded the DFC and so was John on 17 October (“…for exceptional meteorological ability…great determination… accurate data brought back… an example to other observers…”) . 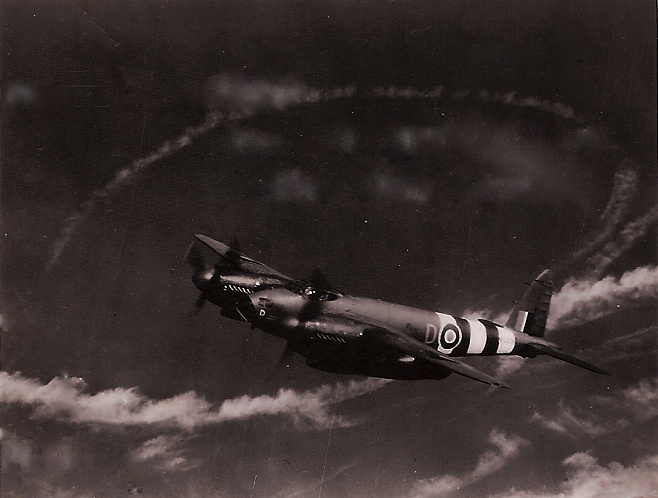 Most of their missions were PAMPA, photographic or meteorological, but occasionally they carried and dropped bombs. As well as the planned PAMPA flights there were daylight ‘snooper’ missions to photograph areas bombed the night before, and ‘stooge’ missions, which seem to have been open-ended recces. 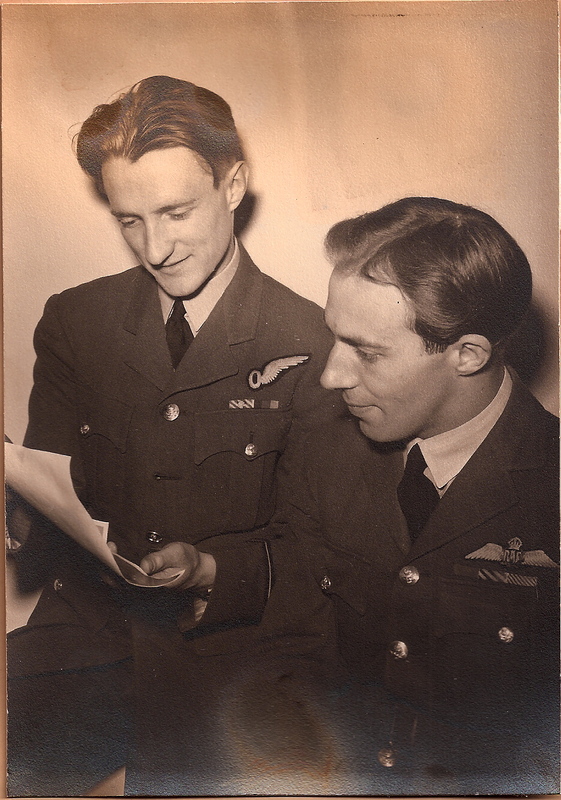 In January 1945 Maurice Briggs and John Baker (now a Flying Officer) were posted to HQ training command. 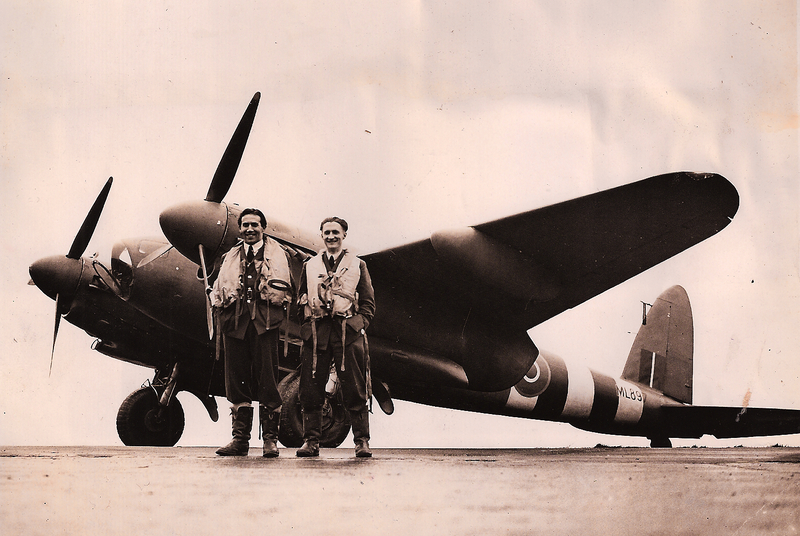 Maurice had completed 145 sorties, Johnny 115, and they had flown 105 of them together. In March 1945, Briggs was awarded a DSO to add to his DFC and DSM and John received a bar to his DFC (for…”exceptional courage, outstanding skill and unfailing devotion to duty…”). In April they flew to Canada to ‘help put over the Victory Loan’. They set off in D for (-Dog or -Dorothy) but soon returned as it had problems and instead took F for Freddie – a veteran of some 211 operational flights. In April John returned briefly to the UK to be best man at his brother Alan’s wedding on 13 April. He was lucky to miss his flight (which went down with all passengers) and crossed the Atlantic on a later one. He returned straight after the wedding and he and Maurice continued touring Canada with F for Freddie. The following day, after an official lunch and some necessary work on the aircraft, they set off to visit two other airfields. They made two passes over the crowd and on a final daring pass clipped the wing on the metal pole above the control tower and crashed, killing both Maurice and Johnny instantly. 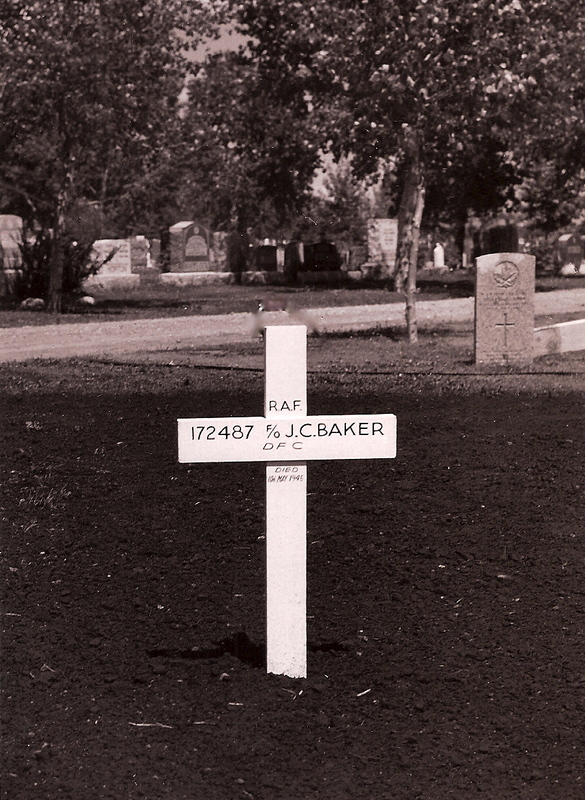 Dear Mr Baker, this is not a standard letter of condolence, as I stopped being in charge of 1409 Flight over six months ago; but while I was there we were such a happy family that the accident at Calgary upset me more than any of the many deaths I have come across in the war. I was surprised to feel like that about it, but I suppose I felt responsible in an indirect way, as it was my idea to show off one of our Mosquitos across the Atlantic, and I did everything I could to make the Air Ministry and DeHavillands interested. Johnnie’s effort of many operations with our unit always amazed me because of his physical condition which obviously wasn’t what ours was. It was absurd him doing a job like that, but obviously very admirable by war-time standards. I remember discussing it with our pleasant medical officer many times: he knew that Johnnie should not really have been doing such a job, but he had obviously been so determined to do it that it was grossly unfair to put a stop to it, and also he was so competent that we were loth to lose him. I remember also taking various important visitors to hear his reports on returning from a trip, because they were undoubtedly the most complete and concise ones we ever got. John was totally happy and fulfilled in his work. He was a willing, if unlikely, hero. Thanks go to Richard de Boer and Mike Cox for keeping Maurice and Johnny’s names alive, for research and for stimulating John’s family to see his legacy in the outside world. What a thorough accounting of your relative, Hilary. Excellent research and documenting indeed. But I am so sorry to hear of the crash killing both Mssrs. 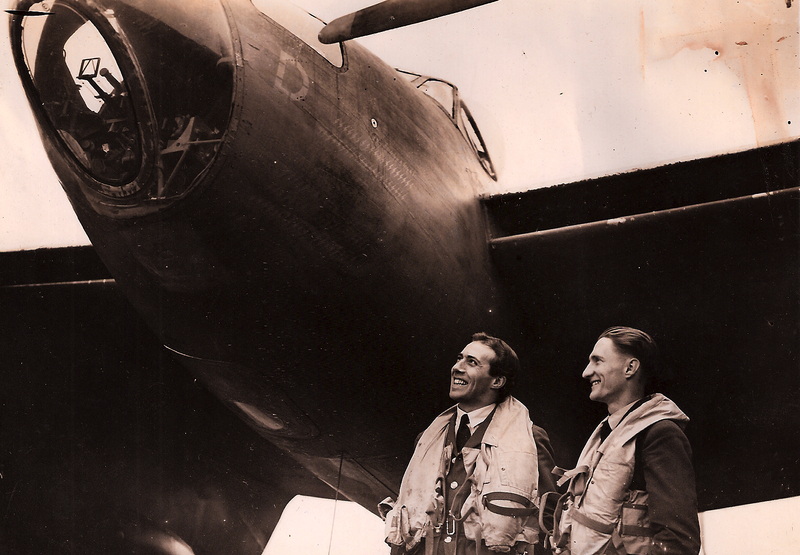 John Baker and Maurice Briggs…and after surviving all those dangerous sorties while at war – recon, no less. 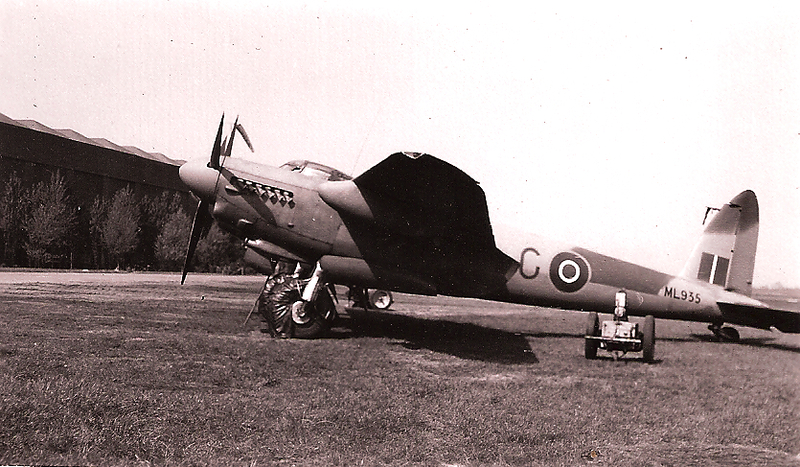 While the Mosquito was incredibly fast, it was due to the wood construction as you know and suited for recon flights. Lovely writing, ma’am. Thanks for those kind thoughts. This is just the basic text of the piece that I sent Pierre Lagacé. He has created a whole blog (http://johncustancebaker.wordpress.com), with more material from me and from others connected with the story and the Pathfinders. Stories like this deserve to be preserved and honoured. Well written and very moving. Thank you. I have been spurred into this by others who keep the flame alive for all those who gave their lives. Interestingly, it is other researchers, who got in touch with the family only recently, that made me really look into my uncle’s service life. I knew him from my grandparents and my father and the photographs, but it was the boy they remembered, not the RAF man. My father, a Far East POW, never saw him as an grown-up. For our generation we now have both images. What a fantastic account, I personally know Joe Patient & have had many conversations with him regarding his time with John and maurice at 139 Squadron & 1409 Met flight. I really think this country will never see a generation of young men like that for quite a while! Wonderful to hear from you, Jason. I imagine from my couple of conversations with Joe Patient, that he never runs out of interesting stories! I am in touch with Richard de Boer, who is writing the story of these two young men. He also advised on the restoration of a Mosquito named for F for Freddie. There is a wonderful DVD of this Gaining Altitude: The Mosquito Reborn, there are tasters here http://gainingaltitudedocumentary.com/videos/. Richard sent me a copy (to the UK), but I also managed to get extra ones from Pan Productions in Canada. Just to let you know if you haven’t heard sadly Joe Patient passed away on the 28th September. I will be attending his funeral tomorrow. Jason, thank you so much. I did know, Richard got in touch with me and I emailed Stewart. Sadly I am unable to attend, I wish I could. I am sure all his friends and relations will give Joe a splendid send-off. I will be there in spirit! Such a bittersweet story. John’s heroism and perseverance in the face of health challenges speak volumes to his character. Was sad to see his life cut so short. May we have many more people with John’s character in our future. We need them desperately now. Thank you for reading this. Indeed we need such characters now. It is up to us to try and step up, though difficult to know how best to do it. Just to let you know HK Models has just released a large scale model kit of the mosquito. Two of the versions available Were flown by Briggs & Baker. One is a 1409 met version & F for Freddie. They are a fantastic kit and one I will be obtaining. Can you give me a link to a website? I am not familiar with the model world (at least not since I was eight years old). If I did want to have a go at building one of these would I be able to get one in the UK? The company is HK Models. If you Facebook HK Models the link will come up showing their range. At the moment they have the earlier version mosquito and are releasing this month the later versions which includes F for Freddie. These are large scale kits really aimed at the proffesional modeller. You would be looking around £130 for this kit. It may seem expensive but these are limited production kits with over 300 peices. Thanks, I did find the website, but couldn’t see the F for Freddie. If it hasn’t come out yet that would explain it. I saw the prices and doubt I will try, though as an former sculptor I would enjoy having a go. Wow. What a remarkable story. I read it before, but just read it again. To keep going with such ‘limitations’ as asthma and a small frame, and to exceed everyone’s expectations so brilliantly — remarkable. Bravo, John. I’m sorry he died like that, Hilary. So am I. I would have loved such an uncle. He was apparently always very quietly funny. I think his reports were were not only very accurate, but made people laugh! Hilary – you may like to see our new page on the Met Flight, which includes details of your account of John Baker. If you would like to get in touch with us, please do so via our website. Many thanks. Jennie Gray, Chairperson of the RAF Pathfinders Archive. Thank you, we are always glad to see Maurice and Johnny remembered. I did not know about your site and will enjoy browsing there.